I grew up playing in Red Butte Creek and its neighboring waterways. I planted trees within Red Butte Garden and still find solace on the nearby Bonneville Shoreline Trail that marks the shoreline of the ancient Lake Bonneville that once covered this valley. 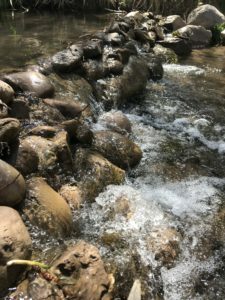 In my short twenty-five years along Red Butte Creek, the flowing water has shaped my story. How have we shaped its story? What happens when deep time becomes human time? Our piping and diverting and quenching and emitting don’t just help society grow and develop at increasingly rapid rates, but also force the planet to change at that same pace with us—whether we want it to or not. Who is speaking on the side of deep time so this creek continues to ripple? Red Butte Creek connects markers of time flowing from Lake Bonneville’s ancient shoreline to the Jordan River that eventually ends in the Great Salt Lake. Climate researchers say the American Southwest faces a 99 percent risk of experiencing megadrought by as early as midcentury. According to scientists, this would place an “unprecedented stress” on already scarce water resources. Less than one percent of all Utah lands are riparian. Time derives from Old English tīma, related to tīd, or the currently used word, tide. The tide of water in this salty valley, its rise and fall, seems doomed to fall and keep falling. There was once a lake here. In 20, 30, 50 years, will I have to say, There was once a creek here? In the new geological epoch, humans are the main drivers of change. The magnitude for the projected rise in temperatures under human-induced climate change doesn’t differ that much from the magnitude of past warming periods. However, the rate of warming varies dramatically. Under current climate projections, global temperatures are warming at a rate ten times faster than the warming rate after the last ice age. 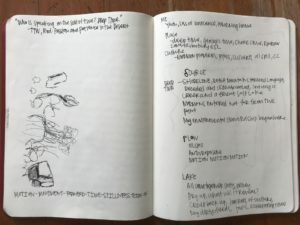 Elizabeth Kolbert says in The Sixth Extinction, “organisms will have to migrate, or otherwise adapt, at least ten times more quickly … How many species overall will be capable of moving fast enough remains an open question.” We are accelerating time. The debate about the exact beginning of the Anthropocene lingers, pointing back to the Columbian Exchange that colonized what is now North and South America, the Industrial Revolution of the nineteenth century, and the global radionuclide fallout of the mid-twentieth century. These coincide with not only noticeable markers in geologic layers, but also moments of horrific human actions—from settler colonialism to the exposure of thousands of downwinders to nuclear testing in the American West and the horrific nuclear bombing in Japan. The moments of measurable human impact on the geology of the planet also correlate with violence against our own species. Even though the military’s activity in the region has created many catastrophes, ironically their actions closer to the Wasatch foothills may have ultimately helped protect Red Butte Canyon. Red Butte Creek provided water for the Fort Douglas Military Base that was built in 1862 along the foothills, and continued to do so until the base closed in 1991. By 1890, the waters of Red Butte Creek were owned solely by the U.S. Army. Because the military owned rights to the water, and the majority of the land in the canyon, the lands were relatively kept free of grazing and farming. Before Fort Douglas was built, the Mormon settlers used Red Butte Canyon primarily as a quarry, excavating the red sandstone beneath the gamble oak, bigtooth maple trees, and cottonwoods for building materials. While the mining operation (including roads, a railroad, men and oxen and horses at the canyon bottom) had considerable impact on the lower half of the watershed, the upper reaches remained relatively pristine. In 1969, when the Army declared Red Butte Canyon as surplus lands, the U.S. Forest Service took over and designated the area as a Research Natural Area because it was one of the last remaining undisturbed watersheds in the Great Basin. Even though the creek is small compared to the nearby drainages, the upper reaches still exist in a more intact state than the other six canyons that quench the thirst of Salt Lake Valley. Where I’ve been visiting Red Butte Creek, a crude oil pipeline runs along the same spot where shore birds used to leave light tracks. The pipeline carries oil from western Colorado and eastern Utah to the Chevron refinery in west Salt Lake. The industry is relatively disguised on this wealthier, whiter end of the Salt Lake Valley. But on the west side, the Chevron refinery emits large plumes of burnt orange-brown and yellow grey smog that places the surrounding communities—primarily lower income and people of color—at disproportionate risks of respiratory and heart issues from air pollution. The potential risks associated with the pipeline were realized on a warm June day in 2010, two days after my eighteenth birthday. 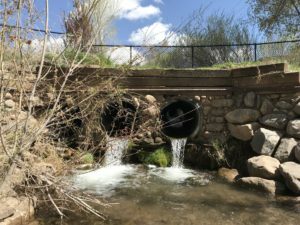 Over 33,000 gallons of crude oil spilled into Red Butte Creek, flowing down through the city neighborhoods, into the pond at Liberty Park—Salt Lake’s central park—and into the Jordan River that flows into the Great Salt Lake. 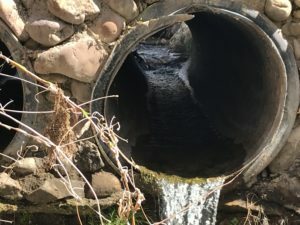 An article in the Deseret News said, “The fracture of the Chevron pipeline sent oil gushing into the riparian corridor, leaving the thick, tacky substance clinging to rocks, soil and any fish and birds in its path.” The pipeline burst again in December, 2010, pouring another 21,000 gallons near the Red Butte Garden Amphitheater. Red Butte Creek is these things, I think, but I can’t help but linger on the sign about water quality and wonder why there’s no mention of the oil spill or the continual threat of the pipeline that runs along the shoreline trail. Does spill connote accident? As in no guilt? No responsibility? No blame? When the oil breaks free from the pipeline it covers the fast flowing creek in a sticky black sludge, and when the oil makes it through the pipeline and out our tailpipes, it contributes to a planetary warming that will push this region into megadrought. Under a human-altered climate, what happens to deep time? With knowledge of the climate projections for this region, I can’t help but wonder when this creek will run dry. 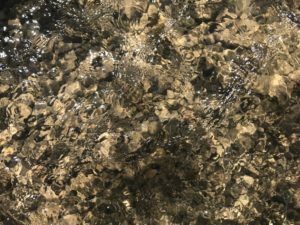 When will we no longer hear water in motion? Ault, Toby R., Justin S. Mankin, Benjamin I. Cook, and Jason E. Smerdon. “Relative Impacts of Mitigation, Temperature, and Precipitation on 21st-Century Megadrought Risk in the American Southwest.” Science Advances 2/10 (2016). Ehleringer, James R., Lois A. Arnow, Ted Arnow, Irving B. McNulty, Norman C. Negus. “Red Butte Canyon Research Natural Area: History, Flora, Geology, Climate, and Ecology.” Great Basin Naturalist 52/2 (1992): 95-121. Fox, Douglas. “Utah’s Ancient Lake Bonneville Holds Clues to the West’s Changing Climate.” High Country News. November 7, 2011. Kolbert, Elizabeth. The Sixth Extinction. New York, NY: Henry Holt and Company, 2014. Lewis, Simon L. and Mark A. Maslin. “Defining the Anthropocene.” Nature 519/7542 (2015): 171-180. O’Donoghue, Amy Joi and Josh Smith. “Oil Spill in Red Butte Creek Threatens Waters, Wildlife.” Deseret News. June 12, 2010. Solnit, Rebecca. Savage Dreams: A Journey into the Hidden Wars of the American West. Oakland, CA: University of California Press, 2014.